Canadian anti-piracy company Canipre has been teaming up with film studios to hunt down and sue alleged BitTorrent pirates. They want to change people's attitudes toward piracy and make a few bucks in the process. However, it appears that the attitude change should start closer to home, as their own website blatantly uses photos that have been ripped-off from independent photographers. Copyright is a double-edged sword, and those who sharpen one side often get cut by the other. We see it happening time and time again with lawyers, lawmakers, anti-piracy groups and copyright holders. The U.S Copyright Group, for example, ripped off the website of a competitor. They copied the design and code of the Copyright Enforcement Group and passed it off as their own. Only when we called them out on it did they remove all “infringing” content. In Canada a similar situation is unfolding at the moment. Anti-piracy group Canipre, who work with the makers of the Hurt Locker as did the U.S Copyright Group, have been busted ripping-off the work of independent photographers. Their dark themed website features images that originate from several photographers, but they all have one thing in common – they are being used without permission. A classic mistake, but one that should have never been made by a company that takes the moral high ground when it comes to piracy. Since Vice Canada broke the news a few hours ago nearly all the photos have been removed. However, there are still screenshots that should be good for an interesting court battle, or perhaps more appropriately, a settlement of a few thousand dollars. Steve Houk, who took the self portrait pictured above, contacted Canipre about the blatant infringement, looking for compensation. “I also told them that it was disheartening to see a company that champions intellectual property rights to pirate someone else’s creative work,” Houk notes. 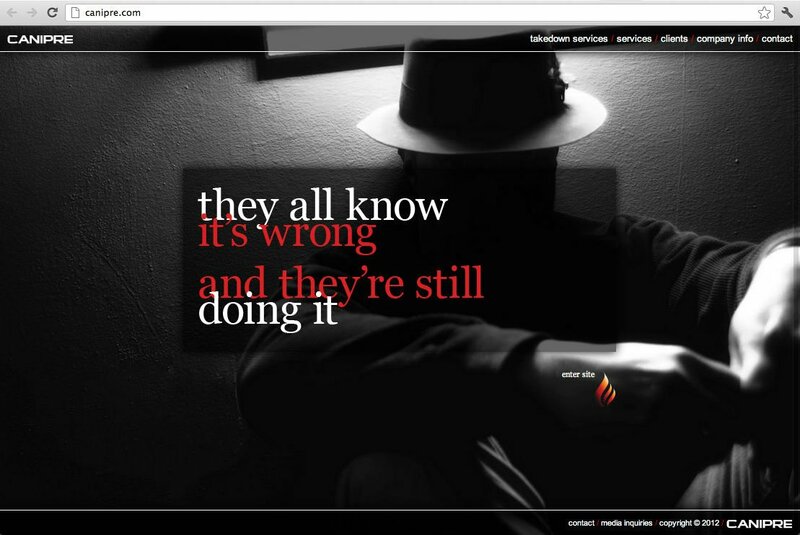 Canipre quickly took on the role of “innocent” infringer and blamed their web design firm for obtaining the photos. The design firm allegedly took content from an image bank, but that would have to be a rogue outfit as Houk never sold away his rights. In any case, Canipre is of course ultimately responsible for the content that appears on their company website, just like they hold an Internet subscriber responsible for the infringing behavior of their neighbors. In addition to Houk, Vice also got in touch with photographers Sascha Pohflepp and Brian Moore. Both confirmed that their work was used on Canipre’s website without permission. “That’s amazing. No, I did not give them permission as far as I know. Go get ’em,” Moore responded. So there we have it once again. An outfit that targets copyright infringers is actively infringing copyright themselves. They are so incompetent and probably blinded by the dollar signs in their eyes, that they can’t even put a website together without breaking the law themselves – the same copyright law they use to go after movie pirates.